Our family loves living in Arizona. The weather is wonderful, we love our neighborhood, we have a great ward, good schools, etc. We are happy here. My biggest complaint about Arizona is that I don't have any family that lives here (aside from my Aunt Sylvia who is simply amazing and a couple of cousins). Luckily, I get to see my family pretty often considering they live on the other side of the country. Some days though, I miss them alot!!! Tyler had her first vocal recital coming up and it really made me wish my parents were here to be a part of it. The night before, in the middle of the night, I was thinking about all this and sent my parents an email voicing my love for them and how much I missed them. Although it's a really personal email, it's part of the story so I will post it. Its times like these (and always) that I hate that we don't get to live by you. My Tyler has her voice recital tomorrow night. I wish so much you guys could be there. She has invited her uncle Sam, Aunt Sylvia and cousin Annie to come and unfortunately, none of them can come. We are going to see if maybe her friend Tatum or Ammon's grandma can come. If not, it will be ok. I tell you this not to have you guys do anything (you don't need to fly out here or call Aunt Sylvia) but just so you know that we miss you guys and love you and know if you guys lived here, you would make sure to come. Adam's kids are lucky little babies that they get to have that relationship with you! I'm glad you guys get to have them close. I hope you had fun with them tonight- I'm sure you did. We love you guys so much. Thanks for your love and support!!!! That arrived at about 3:00 am my parents time. I went to bed and awoke the next morning to my dad saying he wished he could be there too and asking if I would record it so they could see it. That night, as I sat in the recital hall waiting for the recital to begin, in walked my dad!!!!!!!!!!!!!!! Of course, as soon as I saw him, tears filled my eyes. I was overwhelmed with what a selfless, kind gesture he had made. Tyler saw him, and jumped out of her seat and ran across the aisle to him. Tyler's teacher was up at the front welcoming everyone and announced that we had a special guest with us who had come all the way from Atlanta (where he had been in meetings that day). It was a moment that I will remember as long as I live! I am amazing by my dad- always. He is the kindest, most generous, loving, thoughtful man ever! I guess when he got my email at 5 in the morning, he told my mom, as he was on his way out the door to the airport to head to Atlanta, that he wanted to try and come to the recital. My mom went to work on figuring out flights and between the two of them, they made it work. In the meantime, my dad told Ammon what he was doing and Ammon went to work on our end, making sure my dad knew where to go and made Tyler's teacher aware of it so she could move Tyler a little later in the program so he wouldn't miss it. It still chokes me up to think about it. I am so blessed to have my dad. During the recital, I called my babysitter who was at home with my other kids, and asked her to keep my kids awake as we had a big surprise for them. At the conclusion of the recital, we headed home to surprise the other kids. To say they were ecstatic might be an understatement. It was so much fun for me to watch their faces as they realized who was in our home. We made a quick stop at Nielsen's, obviously, and then took my dad to his airport hotel where he had to be up at 4 am to catch a flight home. We saw him for a total of 3 hours. He flew across the entire country to spend 3 hours with us. Some might argue, the length and cost of the flight make it not worth the 3 hours. I disagree. This moment meant the world to us. Ok, so Ammon is a really good swimmer. Like, he still holds City of Mesa records that he set like 25 years ago. So, when we moved to Arizona, the first thing Ammon did was sign our kids up for swimming lessons with the same teacher who taught him how to swim- she is good!!! Ammon was quite devastated when he learned that our kids weren't the blue ribbon type (they got my genes in that area- shoot! And PS- did you see that Ammon? It's not always your fault. I can totally take the blame and admit fault when our kids have a less than ideal trait. ). Anywho, last week, Scarlett started swim lessons. She LOVES it. Ammon may have just gotten his swimmer- but maybe not. Time will tell but looking good so far. Brooke has perfected the home made keylime pie. She has gotten way too efficient at squeezing the limes, making the crust, and assembling them. I open the fridge looking for something healthy and boring and BAM! KEYLIME and of course I have to taste it to make sure it is safe for the rest of the family to eat. Dang you keylime, I hate/love you. Her reaction when it was time to stop the dancing and put some clothes on. Ammon kept asking me, "What are we going to give or neighbors this year for a Christmas gift?". I couldn't come up with anything so I was so excited when Ammon found this idea and organized the whole thing. In fact, loved the idea so much it also ended up going to our kids' school teachers, those we home and visit teach, and a few other special people. See pictures below. They are monogrammed coaster if you can't tell from the pics. It was so much fun to work on these together as a whole family. Props Ammon! Good Night, Sleep Tight- You Know the Rest!!! Etc, Etc, Etc- you get my point. So without further adieu, let me present The Woods Family Vacation 2010. It all started out so promising. Our family had planned a little vacay to San Diego for 5 days. That in and of itself is exciting but to add to it, Ammon was taking the whole week off work! Sunday afternoon, we got or bags loaded into the car and started on the 6 hour drive. After a few potty breaks, a Del Taco stop, and some caffeine for Ammon, we arrived at the condo where we were going to stay at 11pm. We hurried and unloaded the car, got the kids bathed and by 12:30am had everyone asleep. Whew! Ammon and I crawled in bed and I decided to read just a few pages in my book to wind down. About half a page in, I noticed a little bug crawling across my book. Gross. I wiped it off and continued reading. 20 seconds later, another little bug. I jumped out of bed and turned the light on full blast. Ammon and I did a quick inspection of the bed and found lots and lots of the little bugs. We did an Internet search and determined that they were BED BUGS!!!!!!!! GROSSSSSSSS!!!! We flew into action. We got all of our stuff out of the place, forfeited a couple pillows and blankets, and woke up the 4 to load them back into the car. It was now about 2am. We found the closest Marriott and checked in. By 3:30am (after all of our PJ's and anything that had left the suitcase had been washed and dried), everyone was back asleep. At 5am, Ammon had to wake up for work ("Just a quick call and one email to send out."). By 7am, we were all awake. We were still a little freaked from the run in the night before. We decided to check into a different hotel because it had cheaper rates and had 2 rooms to a suite instead of one. Once there, we decided the vacation was finally underway. We went to breakfast, then to the beach. It was a really fun day until.... We came back from the beach and went to go into our hotel room but the key wouldn't open. We went to the front desk and they informed us that they had found in one of the rooms in our building, not ours, BED BUGS!!!!! Are you freaking kidding me. They decided to treat the whole building and move us to another room. So, we were now in our 4th room in 16 hours. We finished off the night and woke up the next morning pretty stressed out. We felt doomed. 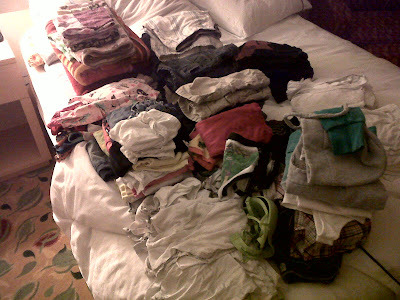 How could we avoid these nasty bed bugs- the LAST thing we wanted to do was bring them home. We decided this vacation just needed to end. At this point, calling us paranoid may have been an understatement. So, we decided to finish off our vacay in Scottsdale and along the way, KILL any and all bed bugs that may have possibly hitched a ride on our luggage or car or anything. So, we loaded up all of our clothes in black garbage bags and duct taped them up. Next, we loaded our suitcases into black garbage bags and duct taped them up. 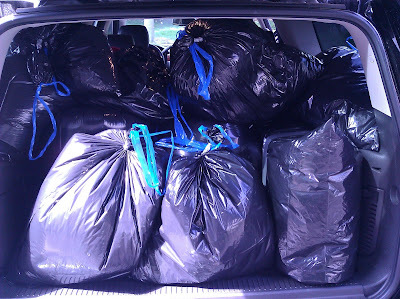 Lastly, we loaded everything else we had with us in black garbage bags and duct taped them and loaded them up. Paranoid? Yep! A car full of duct taped garbage bags, good luck at all the border control check stops! Step one- done! Step two- drive to Yuma where its still hitting 100 degrees a day and park the car with all our garbage bag goods in the sun for a couple hours and let them bed bug suckers BURN!!! Apparently, an hour at 113 degrees kills them. By the way, ask Ammon or me anything about bed bugs, we've done our research. So, we pull into the Yuma Target parking lot, leave everything in the car except for us and what we are wearing and start the bake (we had an hour to kill, of course I choose Target- no brainer). 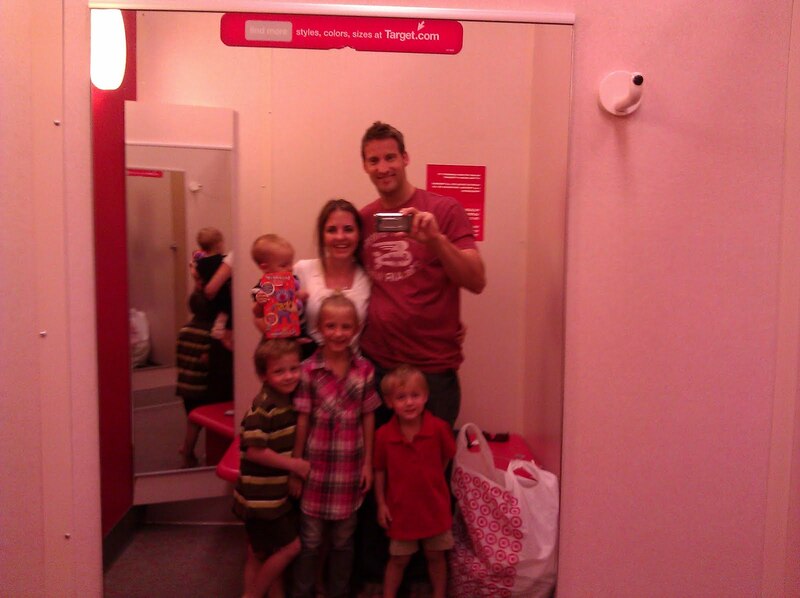 In Target, we picked out a new outfit for each of us. What an adventure! The low point was when all my kids were fighting over which color of bra I should get. Finally, we all made an executive decision- green (TMI). Along with the clothes, we purchased a thermometer- we needed to see 113 degrees with our own eyes. Paranoid? Yep! 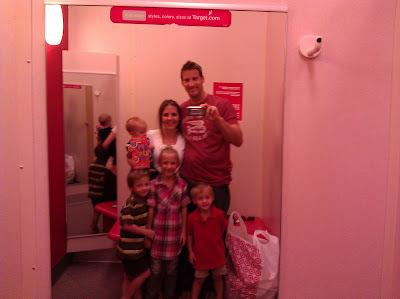 So, once the purchase was made, we all headed for the family dressing room and changed into our new 100 percent bed bug free clothes. Another low point was when Boston kept repeating "Oh, I just feel so clean" over and over in the dressing room. I can't even imagine what those around us thought was going on. Then, we took our clothes we had been wearing, loaded them into a black garbage bag, duct taped it shut and put it into the car oven along with the new thermometer. We then decided to give the bake another hour. 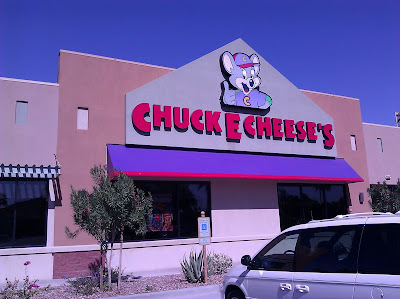 Next we moved onto Chili's in the parking lot for some food. The exciting news is, that stop had nothing exciting happen there- give thanks for little blessings. Once dinner was over, we went back to the car. 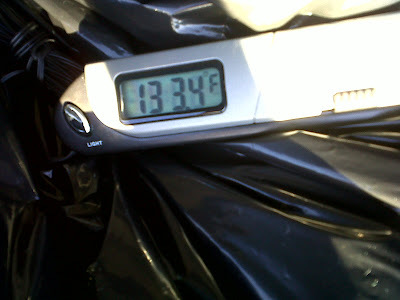 The thermometer read 133.4. Whew!!! Step 2- Done. Step 3- drive straight to the laundry mat and wash and dry every piece of clothing we had on the trip with us. Paranoid? Yep. 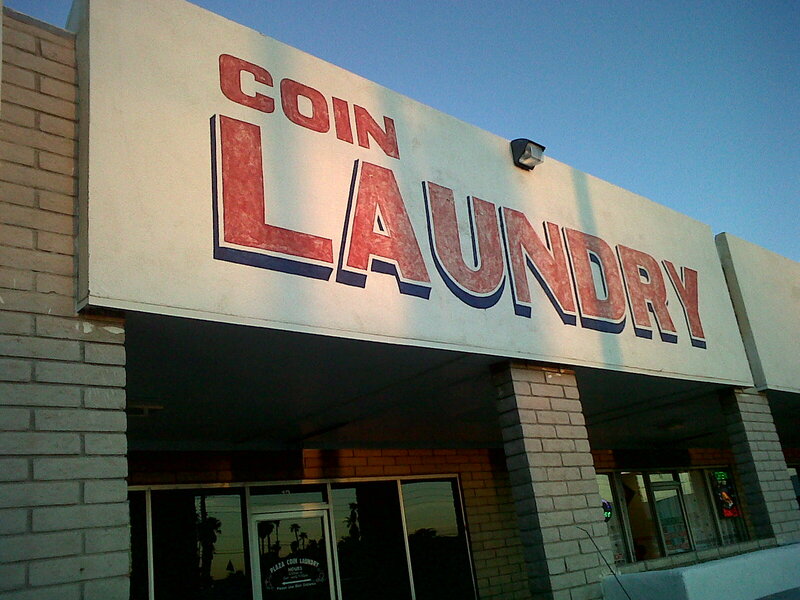 The dryer also reaches hot enough to kill any lingering bed bugs. 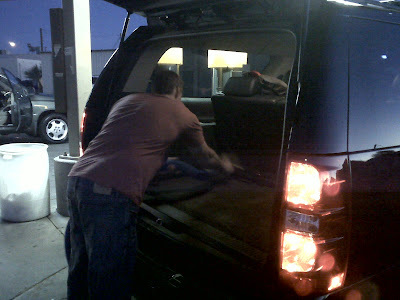 While our clothes were drying, we moved onto step 4- wash and vacuum the car. Once all that fun-family-vacation-fun was complete, we checked into our 5th lodging (well, technically 5th and 6th because it was 2 rooms but then we had to be moved because the rooms weren't adjoining so really 7th and 8th rooms- but who's counting?). I have to be honest, it was a little awkward walking into the hotel with black garbage bags as suitcases. But no worries, after Target, all of our pride was already gone. We got all kids bathed and in bed (after a lot of work trying to find bedding for the crib the hotel brought up for Scarlett) when Tyler comes into our room crying because her ear is killing her. Ammon make a trip to Walgreens to get some Tylenol and ear drops and we fixed her up and sent her back to bed. Ahhhh, piece and quiet. Oh wait, nope- Ryder then came in our room with something in his mouth. When I asked him what he had, he opened his mouth to show me. Throw up. Sweet! It was at that point that we decided, we had had it. No Scottsdale resort. This vacation had to be over. ASAP!!!! Once all the kids were asleep, Ammon and I folded the mountain of clothes and then called it a day too. We woke up the next morning, took the kids to Chuck E Cheese's (cause after all, this is our family vacation for the year)- who knew they open at 9AM?? While in there, we brought out the thermometer to do another bake, just in case. Paranoid? Yep. Then, we headed home. We made it home around 5 pm last night. Everyone was relieved to be here. The kids ran into the playroom, excited to be home- but not before we made everyone strip down and get into the shower and put all their clothes straight in the wash. Paranoid? I'll let you decide this time. Oh, all the original suitcases? Out back in black duct taped garbage bags for the next few weeks. Heck, let's be honest, they'll probably end up in the garbage can in a few months when we get sick of looking at the garbage bags. 1. We got to see our friends from Kentucky, the Garners, while in Yuma. That was really fun! 2. We got to go to the beach. 3. Who knows what we avoided by all of this. Things happen for a reason. This adventure/nightmare may have been really minor compared to what could have happened had we stayed in San Diego. Who knows, maybe this was a blessing. 4. We got to spend lots of time together as a family. 5. Ammon had a few days mostly off work. 6. We all got some cute new Target clothes (especially the green bra). 7. We found the bed bugs so we were able to prevent the spread of them to our home. 8. It's still 100 degrees in Yuma and for that, I will forever be grateful. 9. We found a REALLY good frozen yogurt place in Yuma! 10. We made some memories we will NEVER forget! This one is for the grandparents (and uncle Dan and aunt Loo). Tyler's school talent show (sorry the sound is so poor!). You Still Watching This Mess? Downtown Denver with the Kiddos!